“A as in the best. Going to that school is like going to the Wharton School of Finance if you happen to be doing what you do.” -- Trump to a Coast Guard officer, likening the Coast Guard officer’s school to his alma mater. “I’ve made a tremendous difference in the country. This country’s so much stronger than it was when I took office and you wouldn’t believe it.” — Trump, when asked by reporters on Thanksgiving what he’s thankful for. 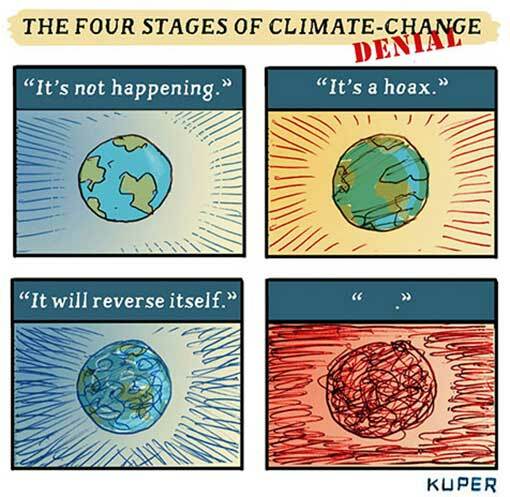 “I don’t believe it.” — Trump about the latest climate report. 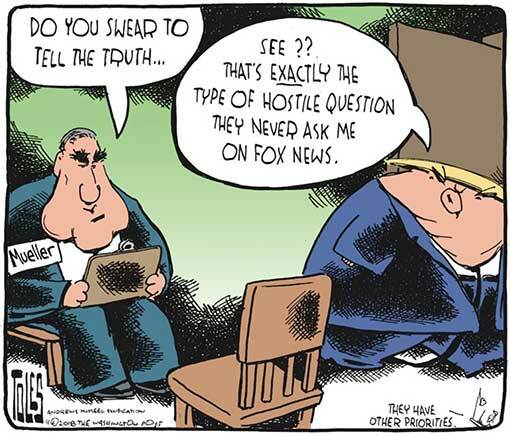 “You watch Fox News, it’s always, ‘Something terrible is about to happen’, ‘Something terrible did happen’, ‘These people are doing all these awful things.’ It is totally divorced from reality, but it is superb propaganda. I don’t know the best way to puncture that. You have to hope that reality catches up with politics and entertainment at some point.” — Hillary Clinton in an interview with the Guardian. “I think the (Mueller) report is going to be devastating to the president and I know that the president’s team is already working on a response to the report. When I say devastating, I mean it’s going to paint a picture that’s going to be politically very devastating.” — Alan Dershowitz, a frequent defender of Donald Trump. “These children are barefoot. In diapers. 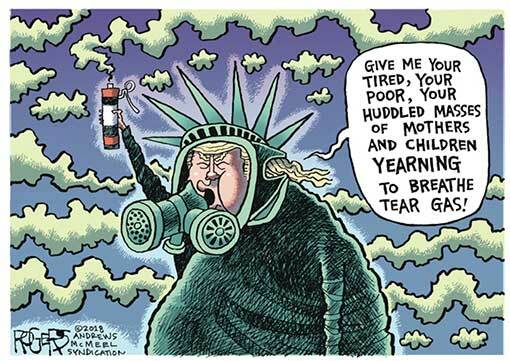 Choking on tear gas. Women and children who left their lives behind — seeking peace and asylum — were met with violence and fear. That’s not my America. 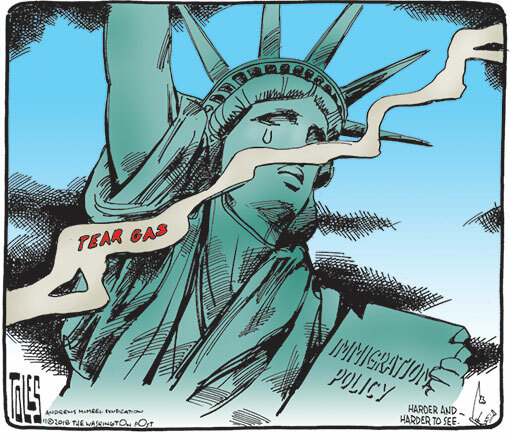 We’re a land of refuge. Of hope. Of freedom. And we will not stand for this.” — Governor elect Gavin Newsom tweet. “I never said he was the best example of the Christian faith. He defends the faith. And I appreciate that very much.” — Evangelical leader Franklin Graham on why he supports Donald Trump. “Texas is no longer, I believe, a reliably red state. We are on the precipice of turning purple.” —Sen. John Cornyn (R-TX. “Heroes will come of this, and it won’t be Mueller and his terrible Gang of Angry Democrats. Look at their past, and look where they come from. The now $30,000,000 Witch Hunt continues and they’ve got nothing but ruined lives. Where is the Server? Let these terrible people go back to the Clinton Foundation and ‘Justice’ Department!” ... "While the disgusting Fake News is doing everything within their power not to report it that way, at least 3 major players are intimating that the Angry Mueller Gang of Dems is viciously telling witnesses to lie about facts & they will get relief. This is our Joseph McCarthy Era"! — Trump tweets, continuing his relentless attacks on the special counsel investigating possible coordination between Russia and Trump’s 2016 campaign. “It was never discussed, but I wouldn’t take it off the table. Why would I take it off the table?” — Trump about a pardon for Paul Manafort. “The amazing thing is that you have certain people who are conservative Republicans that if my name weren’t Trump, if it were John Smith, they would say I’m the greatest president in history and I blow Ronald Reagan away.” — Trump quoted in a new book, Trump's Enemies, written by conservative columnists Corey Lewandowski and David Bossie. “I’m not going to take anything off the table. I haven’t been running around to the most obvious states, laying out the groundwork. Am I going to think about it? Yeah, I’m going to think about.” — Former Secretary of State John Kerry, hinting at another possible campaign for president in 2020 during a talk with Harvard students. Amid concerns about Donald Trump’s fitness to be President, former President Barack Obama said on Tuesday that he was willing to serve as “temp President” while Trump undergoes psychiatric evaluation. Once you agree to cooperate with the government, your interests no longer align (and often clash) with other subjects of the investigation, and such ‘joint defense agreements’ are usually instantly voided. That’s what happened when Michael Flynn flipped last year and with Michael Cohen this year. But that’s not the same as saying anyone involved will be punished — especially if they never misrepresented what they were doing. 1. Mueller is tightening the screws on Jerome Corsi, a friend of former Trump adviser Roger Stone. A plea deal — or charges — appear imminent. 2. Ecuador may be moving toward turning over WikiLeaks founder Julian Assange. The government removed its Assange-backing U.K. ambassador last week, and has prohibited his lawyers from meeting with him. 3. Russian spy and NRA superfan Maria Butina is reported to be in talks for a plea deal. 4. A number of Mueller’s prosecutors were hard at work on Veterans Day —when Michael Cohen took the train to Washington to talk to Mueller’s team. 5. ABC News reported an “unusually high” number — nearly three dozen, in fact — of sealed indictments filed over the course of the year in D.C. Fourteen of those have been added since August, a period when Mueller’s investigation was publicly quiet. Rep. Beto O’Rourke (D-TX) is inspiring aides and allies of former President Obama, who say they could support him if he decides to run for president in 2020. Obama allies are quick to point out similarities between O’Rourke, 46, and the former president, who was 47 when he was elected to the White House. While it’s true that most presidents who see their party suffer major losses in their first midterm election get reelected anyway, Trump isn’t most presidents — and there are lots of blaring-red warning lights in this month’s election results for his bid for a second term. The gross domestic product percentage was “going down to minus 4, 5, 6 percent” when I took office. — Trump describing the country as “teetering” under President Barack Obama. “No agreement of any type between the future government of Mexico and the United States” that will require asylum seekers to wait in Mexico while their claims move through U.S. courts.” — Olga Sanchez Cordero, the top domestic policy official for president-elect Andres Manuel Lopez Obrador. “They better damn well open a new plant there very quickly. I love Ohio. I told them, ‘You’re playing around with the wrong person.’ I said, ‘I heard you’re closing your plant. It’s not going to be closed for long, I hope, Mary, because if it is you have a problem.’” — Trump threating GM president Mary Barra after the company announced it was shuttering several auto plants. 11. It’s Not Just Trump in House Democrats’ Cross Hairs. His Family Is, Too. The Democrats are already laying out lines of inquiry that could quickly lead not just to Mr. Trump and his White House aides, but also to his immediate family. And Republicans returning to Capitol Hill next year may be forced by the changed political climate to take a harder line toward the Trump family. Democratic strategists are absorbing a big lesson from their electoral success this month — stay focused on economic issues and refuse to play on President Trump’s turf” Bloomberg reports. Over the past decade, attackers motivated by right-wing political ideologies have committed dozens of shootings, bombings and other acts of violence, far more than any other category of domestic extremist,” according to a Washington Post analysis of data on global terrorism. 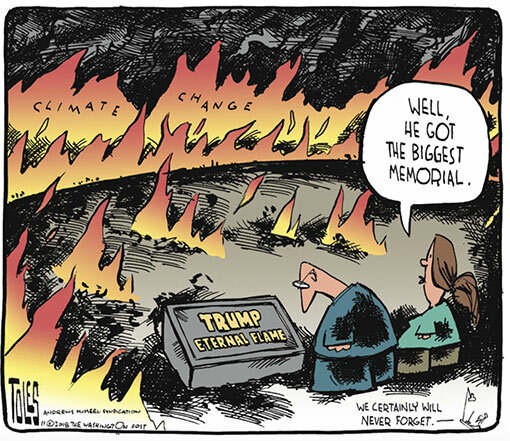 Trump dismissed a landmark report compiled by 13 federal agencies detailing how damage from global warming is intensifying throughout the country, saying he is not among the ‘believers’ who see climate change as a pressing problem. 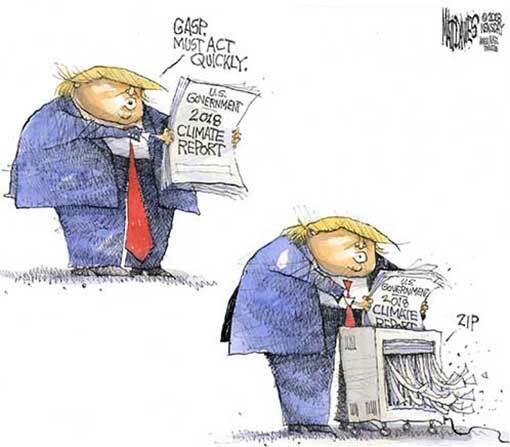 The comments marked the president’s most extensive yet on why he disagrees with his own government’s analysis, which found that climate change poses a severe threat to the health of Americans, as well as to the country’s infrastructure, economy and natural resources. The findings — unequivocal, urgent and alarming — are at odds with the Trump administration’s rollback of environmental regulations and absence of any climate action policy. It’s true there is no criminal statute titled “collusion.” But as I’ve noted in several places, the relevant crime is conspiracy under 18 U.S.C. 371. Collusion refers to an agreement with others to achieve some improper end. In criminal law, we call that a conspiracy – a partnership in crime. And the breadth of the federal conspiracy statute makes it particularly well-suited for cases like Mueller’s probe of Russian interference with the election. Title 18 Section 371 prohibits conspiracies to commit an offense against the United States, which means a conspiracy to commit any federal crime. 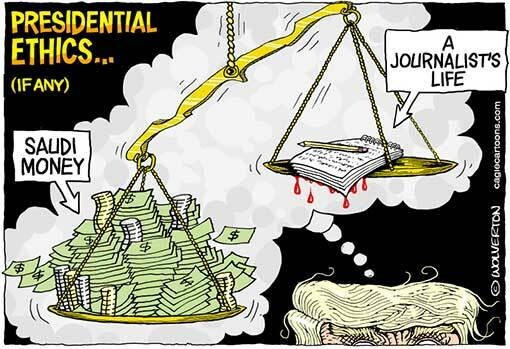 But it also broadly prohibits conspiracies to defraud the United States “in any manner or for any purpose.” For nearly a century the Supreme Court has held that conspiracies to defraud the United States include conspiracies to impair, obstruct, or defeat the lawful functions of the federal government through deceit or dishonesty. 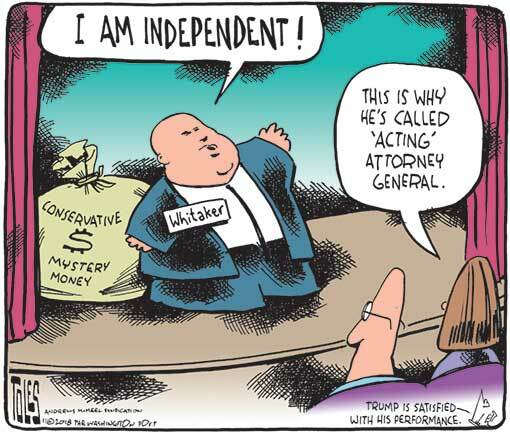 This is true even if the actions of the conspirators are not independently illegal, and even if the government is not deprived of any money or property. If "President" Trump is familiar with this history, he gives no sign of it. As others have noted, his governing principle is borrowed from King Louis XIV of France: “L’état, c’est moi” — I am the state. If you keep that simple maxim in mind, his conduct, otherwise inexplicable, becomes all too predictable. Whatever he does, he does for his own benefit. The conduct of others he judges based not on whether it’s good for the United States but whether it’s good for Trump. Trump cannot be bothered to go out into the rain to honor America’s war dead — or to interrupt his frequent golf outings for an unpleasant and possibly perilous trip to visit U.S. troops in a war zone. When asked about soldiers having to spend Thanksgiving away from their families on a pointless political deployment in Texas, Trump expressed complete indifference. “Don’t worry,” he said on his way to Mar-a-Lago. “These are tough people.” No wonder Trump refers to “my military”: He treats its members with all the consideration he might accord to groundskeepers at Mar-a-Lago. 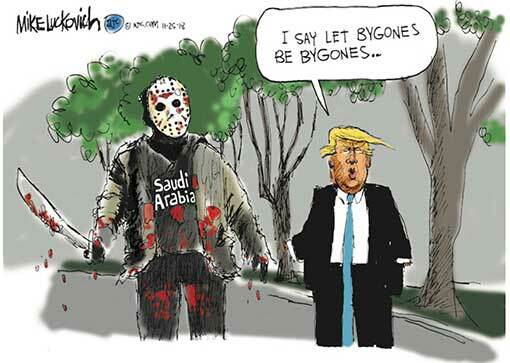 The same solipsism is evident in Trump’s nonchalant reaction to the Saudi murder and dismemberment of Post contributor Jamal Khashoggi. Trump dismissed the CIA’s conclusion that Crown Prince Mohammad bin Salman ordered this crime, writing “maybe he did and maybe he didn’t!” All that matters to Trump is preserving the U.S. relationship with Saudi Arabia, which he justified with fanciful and fictitious figures – $110 billion in Saudi arms sales and $450 billion in general Saudi investment. 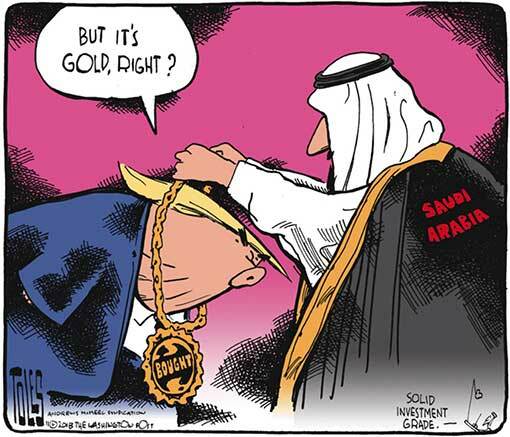 • Ceding any moral high-ground whatsoever when it comes to condemning human rights abuses by letting his Saudi pals get away with murdering a U.S. resident. “When President Trump won the White House in 2016, he did it by hijacking the Republican Party. Now, after what happened in the midterm elections, it’s clearer than ever that the president’s fortunes and his party’s future are at odds. Republican candidates throughout the country found themselves tethered to Trump, sometimes by choice, sometimes when they tried to distance themselves. Trump became the drag that brought many of them down. The Khashoggi affair similarly confirms several fundamental truths about Trump. The first and most obvious is that his narrow, idiosyncratic and sometimes personal interests take precedence over the defense of traditional American values and even the expectation of honest treatment by an ally. Not just Mohammed’s fellow Arab rulers but despots everywhere will study this case and conclude: If you heap flattery on Trump, court him with exotic entertainment, patronize his family businesses and promise to buy American, you can get away with outrages that would once have ensured censure and sanction from Washington. The most enduring and poisonous legacy of the Khashoggi case: the confirmation that truth no longer matters in American foreign policy. A Kissingerian president might have acknowledged that Mohammed was a vicious killer, then argued that we needed to work with him anyway. Trump’s innovation is to say that whether a favored thug ordered a murder or not is not worth knowing — even if the CIA confidently concludes he is guilty. The same goes for the vast benefits Trump claims for the Saudi relationship. It seems to matter not that Riyadh has delivered on virtually none of a promised $110 billion in arms purchases; or that, contrary to Trump’s rhetoric, it is seeking to raise rather than lower the price of oil; or that it is hurting rather than helping the containment of Iran. 8. Seth Harp: Is the Trump Administration Pivoting the Fight in Syria Toward a War with Iran? 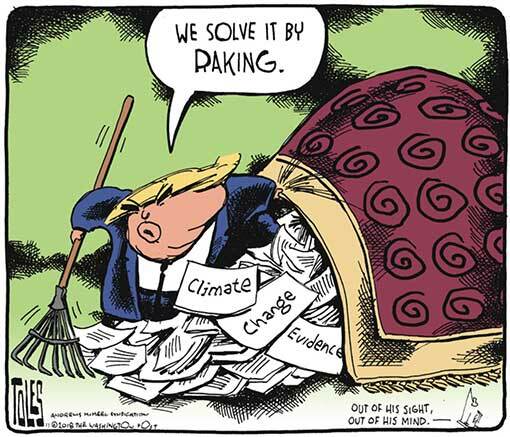 Trump has been demanding that his aides draft a plan to reduce the swelling budget deficit while simultaneously ruling out virtually all categories of possible deficit reduction and demanding new deficit-increasing measures of his own. The Washington Post has plenty of hilarious details from the administration’s internal fiscal deliberations, such as they are. Trump comes across as possessing every bit as much fiscal acumen as you would expect from a man who managed to bankrupt a casino, required hundreds of millions of dollars in secret cash infusions from his father to stay afloat, and can barely absorb written material of even the shortest length. On Monday we learned that despite going to prison as part of a plea deal, President Trump's former campaign chairman Paul Manafort continued to lie to the FBI, according to Special Counsel Robert Mueller. Then on Tuesday, The Guardian reported that Manafort met with WikiLeaks founder Julian Assange multiple times, including in March 2016, the same month Manafort was first hired by the Trump campaign. It's as yet unknown what they supposedly discussed — though "Russians" also reportedly were among Assange's visitors. There is no conclusive smoking gun here, and WikiLeaks has as usual denied everything. But (provided The Guardian has the goods here) politics is not a criminal court, and people can draw sensible conclusions. At this point, we can say with near certainty that Trump conspired at some level with Russian sources to win the presidential election and has tried over and over to cover it up.